Description: Trendy cupcakes may come and go, but cookies are a timeless treat! If you miss the days when snacks were simple and handmade, you’ll love this homespun encyclopedia of cookies. 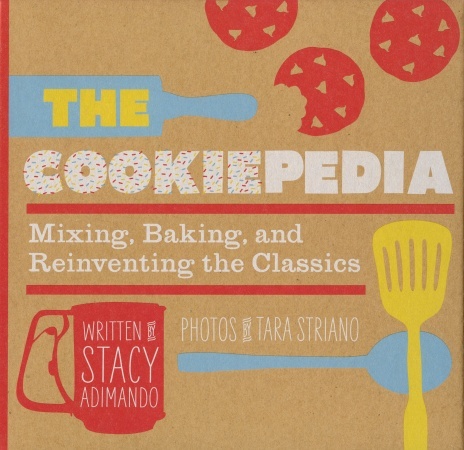 Full of hand-drawn illustrations and gorgeous photographs, The Cookiepedia features recipes for everything from Amaretti and Almond Biscotti to Mint Thins, Macaroons, Chocolate Chip Cookies and dozens of other favorites—more than 50 recipes in all. With a lovely lie-flat binding and a delightfully whimsical design, The Cookiepedia is a trusted companion for a new generation of bakers. Finished Jam Thumbprint - don't look as nice, but they be yummy! I love, love, love the classics - oatmeal chocolate chip cookies, shortbreads and thumbprints, as made by my granny and my mom. The recipes have been lovingly passed down to my nieces now, and they love making them for exam stress relief (let the tradition continue!!). Favourite cookie (by far!) are my own homemade ginger sugar cookies that only make their appearance at Christmas and my sister's oatmeal cakes. Sooo yummy, I'm thinking I will have to put in a order of them to her asap! I love white chocolate and cranberry cookies. Good, I'm glad to see I'm not the only boring one...my fave is still good old fashioned chocolate chip cookies. I do have a lavender shortbread I want to try though. I love oatmeal raisin cookies but I'm also pretty fond of sugar cookies. It's a tough choice! I love stroopwafels--Dutch syrup waffle cookies. My favourite cookie that I can actually make is oatmeal chocolate chip. I love chocolate chip cookies so do my children! Would love to try these. My favorite are Mexican wedding cookies, especially when my sisters makes them! Yum!! !